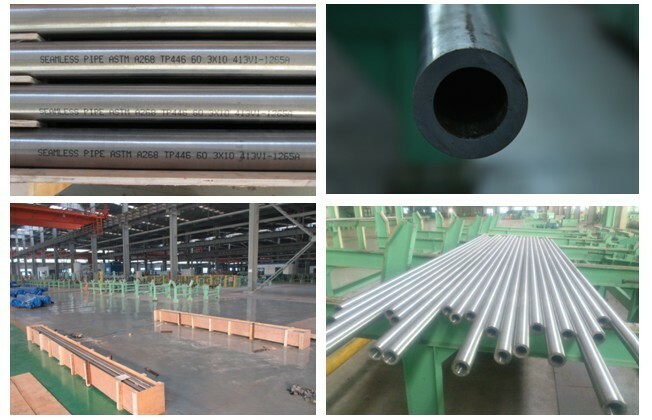 On 10th NOV,2013, LSI complete W/O for ASME SA268 TP446-1 Seamless Hot Extrusion Tubes to Overseas Market together with Chinese Army Corporation, which is the first time by Asian Manufacturer to fabricate this Material in Hot Extrusion Procedure in seamless way. This Material TP446-1(UNS S44600) is known as Sandvik4C54(Brand hold by Sandvik) for its extremely good resistant to reducing sulphurous gases and the resistance to oxidation in air,oil-ash corrosion as well as the resistance to molten copper,lead and tin.TP446-1 also can be used in high temperature under 1120℃. TP446-1 is hard for cold processing way,which LSI ever tried to improve in cold finished seamless sample tubes in Lab, but failed. However we are glad to see TP446-1 with good property in hot extrusion procedures and finally we success cooperated with one of former Chinese Army Corporations. Now all the tubes has been tested and inspected by LSI QC and customers, the test results meet the requirements of customer and standard ASME SA268. If you have more queries and advice about TP446-1 Seamless Tubes, please do feel free to contact LSI, we are pleasure to hear your voice in this material and hope for your satisfaction in our products.